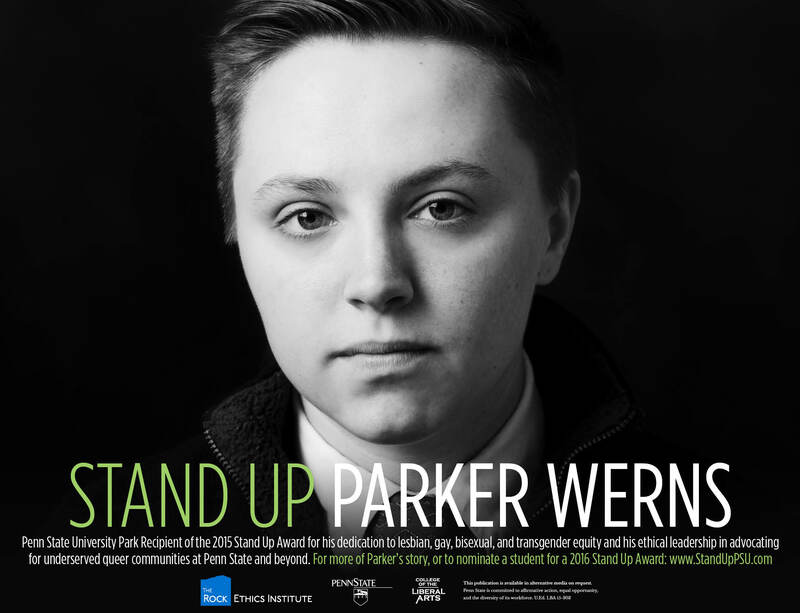 This guest post is written by Parker Werns, a 2015 Stand Up Award recipient. You can see more of his story at www.StandUpPSU.com. Across the United States, people are celebrating — another state is recognizing marriage equality! The fight for gay rights is over in another state. However, there are countless issues a queer person must face before they can think about getting married, and there are countless issues they must face afterwards. Marriage equality is just one snapshot of equity in a queer person’s life. As children, queer students are routinely bullied and harassed in school and at home. These difficulties lead to mental health issues and a higher rate of risky behaviors, including problems with alcohol and substance abuse. Along with violence, queer people suffer discrimination in housing markets and hiring processes – in more than half of the United States, there are no laws that specifically tell employers that discrimination against LGBT people is illegal. Unfortuately, these problems are also happening at Penn State. Although we try to have a focus on the idea of a “Penn State family,” LGBTQ students, faculty, and staff have to struggle with ignorance, discrimation, and institutional policies that can make their lives incredibly difficult. This is happening in a state where gay marriage is legal – obviously, it’s not a catch-all solution. Luckily, there are many Penn Staters and Penn State organizations that are working to correct those problems. The LGBTQA Student Resource Center, located in 101 Boucke, provides resources, discussion groups, and a safe space for queer students. The President’s Commission on LGBT Equity, which I am a chair of, advises President Barron on how he can best help his LGBTQ constituents. Even if you’re not directly involved with these groups, there are easy ways to make Penn State safer and more comfortable for everyone. The first is to educate yourself on queer issues besides marriage equality. Learn what issues queer people are really facing at Penn State — is there violence happening? Are businesses refusing service? Then, take what you’ve learned and teach others. Explain that there’s always more to be done to help. While educating others, make sure you’re a good ally to your queer friends and neighbors. Stand up for them, listen to their lived experiences, and support local queer-friendly businesses like Webster’s or Chumley’s. If you can, take your activism a step further and attend events put on by the LGBTQA Center or that support LGBTQ people. Instead of celebrating and moving on when a state grants marriage equality, look for other ways you can help. There’s a lot more to be done for queer equity in the United States and at Penn State. Getting marriage equality in Pennsylvania wasn’t the end of the fight for gay rights at Penn State – it’s the beginning. We all need to work together to make that a truth instead of an empty promise.